Mitglied werden - DAAD-Freundeskreis e.V. 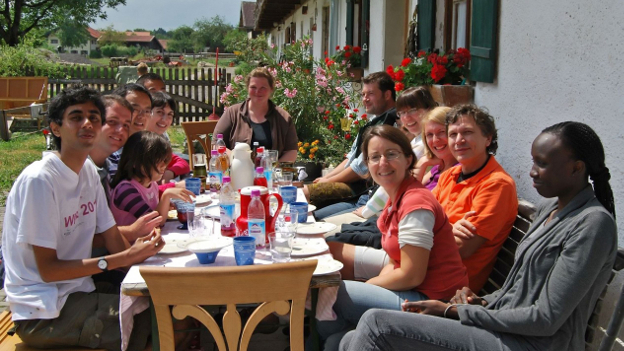 The DAAD Alumni & Friends has around 1,300 members in Germany and abroad. More than 100 people are actively involved in the work of the regional groups. Our activities are aimed at all DAAD scholarship holders during their stay in Germany. Become part of DAAD Alumni & Friends! Most DAAD Alumni & Friends’ members are former DAAD scholarship holders, DAAD instructors or DAAD staff. Anyone who wants to support international and intercultural exchange may join the association. …network with DAAD scholarship holders and alumni from all around the world. …exchange views across disciplines and generations. All members receive the DAAD alumni magazine LETTER free of charge and are invited to the annual meeting of members. Membership is €50 a year. Students and doctoral candidates pay a reduced fee of €25 a year. When you join, you can also register a monthly donation, which will increase your membership fee. Of course, you are free to change your donation at any time. DAAD-Freundeskreis e.V. (DAAD Alumni & Friends) is recognised as a non-profit association. Membership fees and donations are tax deductible. Donation receipts can be issued upon request. What Do You Need To Do To Become a Member? Fill out the membership registration form online, and then send us the signed SEPA Mandate SEPA mandate (pdf, 494.26 KB) by post. This is available for printing when you register. Alternatively, you will find all registration documents here as a PDF file: Membership declaration (pdf, 188.05 KB) (including SEPA mandate and leaflet on data retention). Join DAAD Alumni & Friends. Contribute to our commitment for DAAD fellows. Enjoy the many benefits of membership.